We are a motorflyingclub located 15 minutes south of Kristianstad, in the beautiful northeast Skåne. 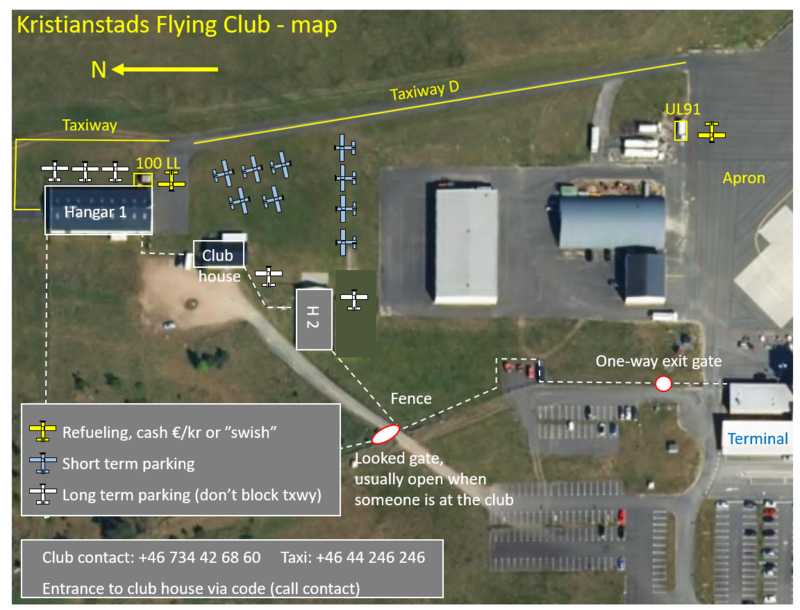 You find us on Kristianstad Österlen Airport, north of the apron (via Taxiway D). Accomodation is possible in the club house. Hotels, BnB etc are located in Kristianstad or Åhus/Yngsjö. Transportation via bus or taxi +46 44 246 246. 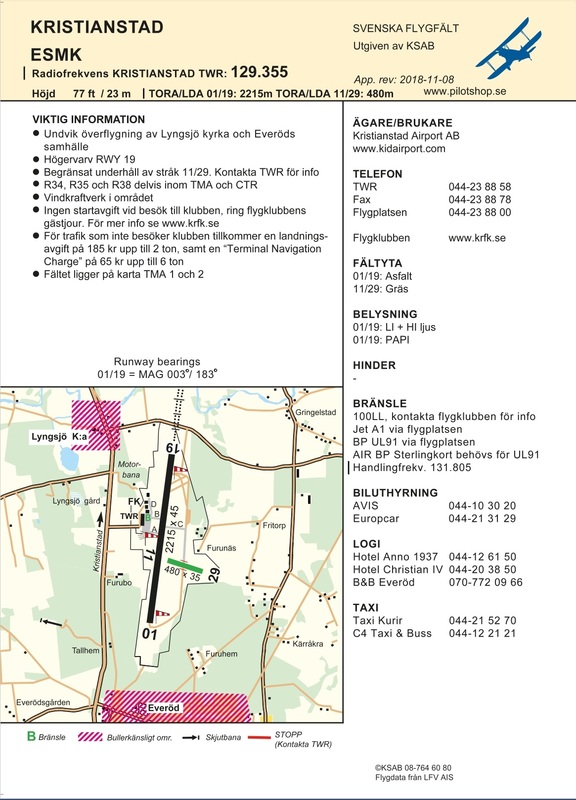 Kristianstad Airport, ESMK, is a controlled airfield. Official information is found in IAIP. 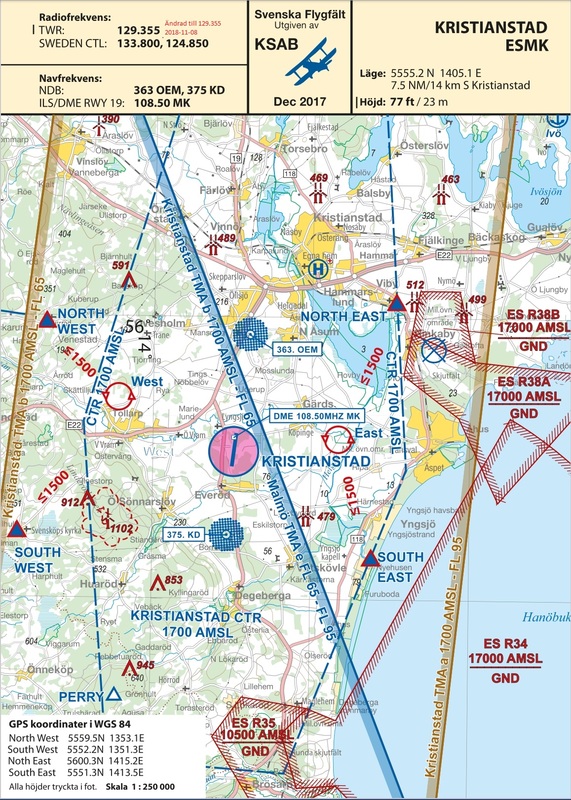 PPR is not required for VFR. Airport tower: 129.355 (”Kristianstad Tower”, outside of operational hours call ”Kristianstad Radio”). Runways 19/01: right-hand circuit runway 19. There is also a rescue helicopter stationed at ESMK and it operates also outside tower hours. They do appriciate that your transponder is turned on so you are visible for them (although it is not a requirement when the tower is closed). Its callsign is Lifeguard+tre digits. When its on a rescue mission the call sign changes to Rescue Lifeguard and it should then have highest priority. BP UL91 and Jet A1 provided by the airport; For UL91 you need a BP Sterling UL91 card (but we could also manage it via the club if needed). 100 LL is provided by the club, cash payment 2.6€/l . If you would like assistance from the club, contact us preferably via guests@krfk.se (is checked several times per day) and provide us with ETA/ETD, registration and other information. You could also call +46 734 42 68 60 but we are not always able to answer. If you need to enter the club house and nobody is present then call us and you will get the code to get access to the club house. If you arrive and need to leave the field ”via the ground” (and nobody is present) there is a one way gate you could use. When coming back and the club is closed then you could pass through the terminal (if its open), otherwise you need to contact the club via the number above. There is no landing fee if you sign the guestbook at the flying club (just inside the entrance door). There is no fee for parking the plane on the grass. But if you would like to have it inside a hangar (if there is space) then the fee is 100 SEK / 10€ per 24 hours. We have some foldable beds you could use if you need to stay at the club house during the night. We then ask you to ”contribute” to ur club with 100 SEK/10€. Observe: according to koncessionsnämndens decision KN120/97, touch-and-go’s and skydiving is not allowed the following days: Good Friday, Easter Day, Ascension Day, Whitsun Eve, All Saint’s Day, Christmas Eve, Christmas Day, and two sundays in July (decided at the yearly meeting). Latest published airport platesfrom Svenska Flyfält.